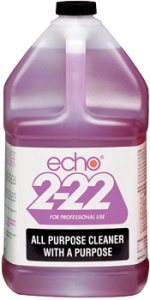 Echo 2-22 Purple™ is a high alkaline cleaner formulated with a blend of surfactants for heavy-duty cleaning. It is most useful in removing soils that are grease or oil related. It has also proven effective in removing inks and carbon. Depending on the dilution factor, 2-22 Purple™ can accomplish a wide range of cleaning and degreasing problems. 1. Can be diluted up to 32 to 1 and still be very effective cleaner or concentrated for tough jobs. 3. Rinse thoroughly to be cleaned. 4. 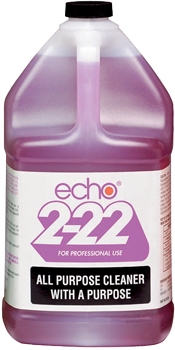 Echo 2-22 Purple™ should not be left on painted surfaces.